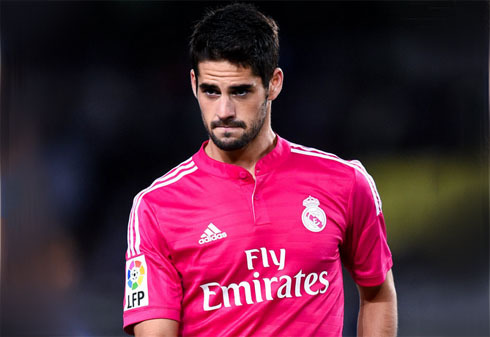 ﻿ Isco: "Cristiano Ronaldo is on the right track to win the FIFA Ballon d'Or"
03.11.2014 » Isco: "Cristiano Ronaldo is on the right track to win the Ballon d'Or"
In a quick interview granted earlier this Monday to bwin, Isco had no problems in stating that he sees Cristiano Ronaldo as the biggest favorite to win this year's FIFA Ballon d'Or. The 22-year old also revealed that he hopes to continue having opportunities to play regularly for Real Madrid, a club the Spaniard believes to be the best in the world. Over the past few weeks, there's no other player in Real Madrid's ranks who has seen his influence and status within the team increasing so much as Isco. The 22-year old midfielder started by making the best out of the few opportunities he has had to show his value and now that Gareth Bale seems to be back from injury and fit to play again, it might not be Isco the one who stays on the bench... The Spanish international talked with one of Real Madrid's betting sponsors (bwin) this Monday afternoon and stated that having in mind everything that Cristiano Ronaldo has already done this year, he should clearly be the main favorite to win the FIFA Ballon d'Or. The ceremony in which the award will be given out will take place on the 12th of January of 2015, in Zurich (Switzerland). Isco: "I've been in Madrid for more than a year now and all I can say is that it's been a very positive journey so far. I know I'm in the best football club in the world, winning titles such as the previous UEFA Champions League edition and I hope we can continue on this path", started by saying the former Malaga midfielder, who has had the fortune of winning the biggest competition in Europe right in first year playing for the Merengues. Isco: "With the new signings settling in better by the day and the team spirit we've built, I think we're getting stronger in each game we play. We're all hoping to extend the current winning streak for as long as possible", stated Francisco Román Alarcón Suárez (aka Isco), when referring to the 11 consecutive wins that Real Madrid has already pulled off this season. Isco: "In my personal opinion, Cristiano Ronaldo is the main favorite to win the FIFA Ballon d'Or this year, because of everything he has done and showed so far. He scored plenty of goals for us and he also added a few important titles to his records", analyzed the 22-year old. Tomorrow night, Real Madrid meets Liverpool for the second time this season, after having already won convincingly 3-0 in Anfield Road, just a few weeks ago. The Reds are coming to the Santiago Bernabéu as huge underdogs, but Isco clearly prefers not to underestimate them in the slightest way. Isco: "Liverpool are a very strong opponent and a club with a great history. We shouldn't take anything for granted because in any given moment of the game, they can hurt us and suddenly put us on a bad spot. However, it's true that at the Bernabéu we may have more chances of finishing the game with the 3 points than them. We must be alert throughout the 90 minutes though and simply do our best to approach this match with the same attitude and determination we've showed so far", commented the Spanish midfielder, who will most likely be in the starting lineup this Wednesday night. Cristiano Ronaldo next game for Real Madrid is a Champions League fixture against Liverpool, scheduled for November 4 (Tuesday). You can watch Juventus live stream, Real Madrid vs Liverpool, Ajax vs Barça, Juventus vs Olympiacos, Arsenal vs Anderlecht, and Borussia Dortmund vs Galatasaray, all matches provided from our live streaming game pages.